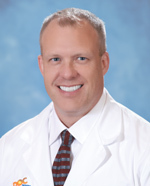 Andrew Allen, M.M.Sc., PA-C joined Desert Orthopedic Center in 2004 after receiving a Master of Medical Science from the Yale University School of Medicine in 2003. A native of Ohio, Andy achieved the basis of his medical expertise as a hospital corpsman in the U.S. Navy from 1991 to 1996. After leaving the service, Andy attended the University of Southern California where he received a bachelor’s degree in gerontology in 2001. He then attended Yale. He earned academic honors at both USC and Yale and augmented his academic efforts with volunteer work and internships in medicine. Andy is a certified physician assistant and a member of several professional organizations, including the American Academy of Physician Assistants, Physician Assistants in Orthopedic Surgery and Affiliate Society for Surgery of the Hand.